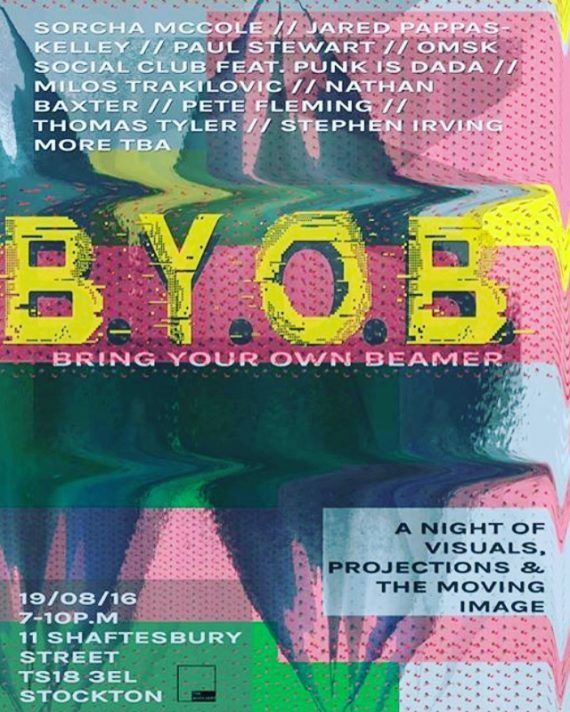 Since 2010, Bring Your Own Beamer has allowed for a chain-mail of on-going one night stands of video/visual/film nights– from Berlin to Los Angeles, London to Glasgow and now in Stockton, Teesside. 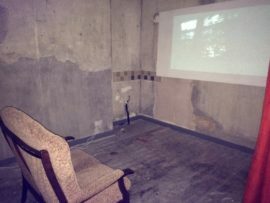 Hosted by Auxiliary (Run by Liam Slevin and Anna Byrne) Bring Your Own Beamer now situated in a house/semi-converted gallery/living space, featuring a host of local and international artists. 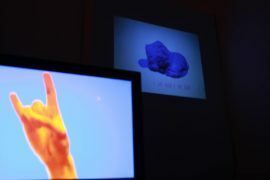 –a mad medley of sound and visuals from at least 14 different artists were screened in every corner of the building. A huge line-up of Local artists presenting visuals that were together with artists from Berlin and Ireland. The first work in the upstairs bedroom to catch my eye was by OMSK Social Club FKA PUNK IS DADA presenting ‘MEAT SPACE # MY GIRLFRIEND IS THE REVOLUTION’ a visual depiction of a ephemeral action, expressing the commodity shift of… “Cyperpunk 90’s dream utopias to the legitimacy of reality in cyberspace.” (http://www.punkisdada.com/) This work was just one of many in the former bedroom now screening room of Auxiliary including Miloš Trakilović , M/Other, which had a visually gripping fluidity alongside the racketing poetry slam resonating from the speakers. 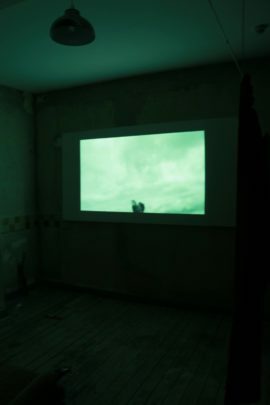 Also in this space was Paul Stewart’s , I am god: I am nothing a depiction of magnetic putty eating itself, Thomas Cole Tyler’s vertical flickering screen of Clouds: Embracing The New Aesthetic and KA Bird’s projection, Girls Night in . This room was a mass of screens and projections that emphasised the vivid narratives that runs through each of the works and work that really deserves to be seen. Leading onto the landing two more videos were installed one from Nathan Baxter across the ceiling and the other being by Jared Pappas-Kelley . 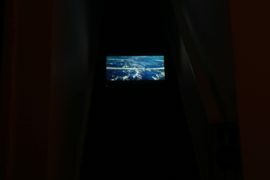 Pappas-Kelly’s TV set halfway up a second set of stairs displayed the work ‘the quiet life (rough-cut)’ a droning sound running over visuals of flight. From the stairs to the final room on the 1st floor, you enter a space straight out of a Hitchcock how-to-guide. A red curtain and a single chair facing a projector screen, in a semi derelict cosmos. 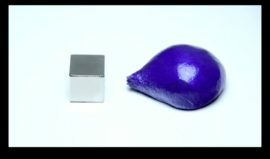 Here four videos on loop from the Experimental Film Society were available to consume in comfort and the pleasure of a room fit for an Omen remake. Back down stairs Sorcha McCole occupied the bottom library room with a three TV setup, McCole’s work was an installation; combining video, audio and light to create an immersive ‘dream’ environment. 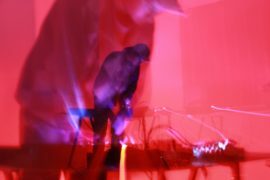 Sounds, sets and harsh noise came from the living room as well as a live streaming video of the space installed by artist Ryan David Butler. Ambient drones from 2501 and Spectacular Optical creating appropriated electronic techno played throughout the night. Heading to the kitchen to pick up a fresh stubby and a hotdog you are greeted with work by Stephen Irving. 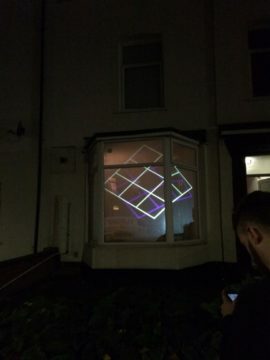 Projected onto buttermilk smeared windows were oscillating squares of different colour, light and hue, as a visual representation of the song ‘somewhere of the rainbow’, which was weirdly mesmerising. It was a strong night that was able to deliver enjoyable visuals and harsh tunes as well as give Stockton its first taste of BYOB. 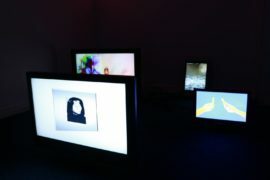 The concept was pretty simple: get a group of artists to drag their work, a screen, a beamer and install them in the space. 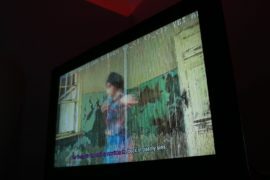 Simple right – the subsequent cacophony of noise and light exploded onto every inch of wall, floor, window and ceiling. 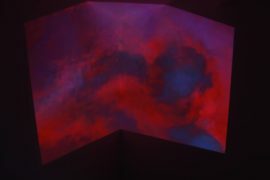 All the works installed were from different heights and angles, creating an immersive, surreal environment of intense colour and din. What’s not to like? A hugely successful event at the Auxiliary that puts into question what is needed in time of a gallery setup when all you need is some power, a plug, 50p cheese toasties and cheap beer? Here’s to the next. Garden Tunes by Spectacular Optical. The idea for this series is the brainchild of Rafaël Rozendaal.